The revolutions of the Arab Spring took the Middle East and North Africa (MENA) region by storm as countries from Syria to Libya participated in a most unanticipated democratic movement. Millions of citizens took to the streets to express their open and blatant anger against their oppressive regimes while world leaders made statements and pressured these authoritarian leaders to surrender to the demands of their people. While some countries have boasted quasi-successes in their revolutions, others have suffered as a result of the people’s demand for reforms towards a democratic system. In these nations, regimes have deployed military and riot police to quash the protests and silence the people, turning what were once peaceful nations into cauldrons of violence. In Syria, chemical gas was used against residents living in rebel –held cities. In Egypt, snipers shot at protestors. And even in the small Gulf kingdom of Bahrain, security forces beat and imprisoned demonstrators, who were then, tortured and detained for an indefinite amount of time. For the past several years, Bahrainis, particularly Shi’ite citizens, have been demanding their basic rights from the dominant Sunni government. The Bahraini royal family has responded in many ways, including using force and committing human rights violations against their own citizens. These protests, taking place in a country with a population of just over 1 million people, have gone largely unnoticed by the international community. But perhaps that’s by design. As the third country to participate in the Arab Spring, Bahrain’s pro-democracy movement has received little international media attention because, according to some human rights advocates, the ruling family has been effective in hiding it. The ruling government has systematically cracked down on the protests and, at times, placed the country on a lockdown by denying entry to human rights organizations and the media. 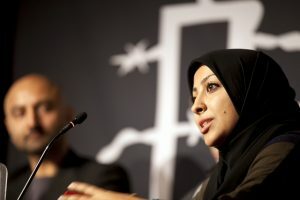 The daughter, sister and niece of three political prisoners currently detained in Bahrain along with thousands of other protesters, Maryam AlKhawaja has made it her purpose to spread the word to the international community about the uprisings in Bahrain. Exiled from her native Bahrain, she now resides in Denmark, where she holds dual-citizenship and continues her work as a human rights advocate for The Bahrain Center for Human Rights and The Gulf Center for Human Rights. 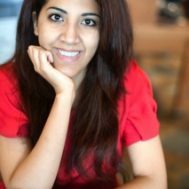 I had the chance to interview Maryam and ask her some questions on the current state of affairs in Bahrain. Many people have no idea what is happening in Bahrain, can you please explain to us what are the protestors’ demands and give us a quick overview of the uprisings since they began? 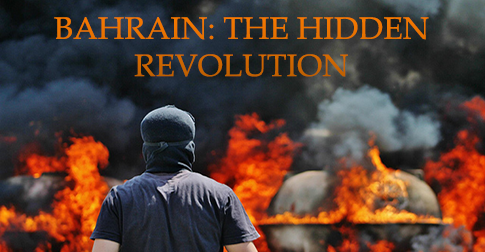 To understand the current situation in Bahrain, you need to understand the background of it. The civil rights movement in Bahrain began in the 1920s and has been ongoing ever since. So when the Arab Spring started in Tunisia and Egypt, we knew it was bound to happen in Bahrain because the people have very legitimate demands relating to basic rights and civil liberties… In Bahrain, hundreds of thousands of protesters took to the streets, a significant portion of the population as it reflects approximately fifty percent of Bahraini citizens, no such amount ever came out against an oppressive regime during the Arab Spring. As per usual, the Bahraini monarchy responded with the use of force, which caused the protests to increase as anger built up among the people on the ground at the use of force. This also caused demands to be changed from demanding a constitutional monarchy to demanding that the monarchy steps down altogether. As the protests continued to escalate in the Pearl Roundabout, the regime realized that they would not be able to suppress the protests with the forces that they had; they called in reinforcements from Saudi Arabia and the UAE under the guise of the Gulf Cooperation Council (GCC) to help with the situation on the ground. Foreign forces came in through the bridge that connects Bahrain to Saudi Arabia and helped the Bahraini government take down the protests. Since then, systematic human rights violations are widespread and people are not allowed back into the roundabout. Whether you’re talking about freedom of expression or freedom of assembly, basic human rights and basic liberties are not available in Bahrain. Torture is rampant; people get arrested all the time not simply for participating but also for living within the vicinity of a protest. Throughout my research, I read a lot about the monarchy wanting to suppress and eventually dilute the Shiite majority in the country. That being said, do you think that the protests reflect the Sunni versus Shiite issues in Bahrain or are both sects united in their stance against the government? Is this tagline merely an excuse used by the government in order to cover up the fact that the people don’t want this king in power any longer? What the government did after the initial protests in 2011 is it used a very sectarian narrative and created a very sectarian crackdown. The reason for this is that the regime understood that if they are not successful in separating the Sunnis and the Shiites in Bahrain and making the protests look like they are sectarian then they would be forced to change and this is not something they want to do. They used the sectarian bit as a tool to tell the international community that this is an uprising of the Shiite and it’s linked to Iran and that this has nothing to do with the Sunnis in the country. This also leads to their next purpose, which is to create a separation in the community and the society between the Sunnis and the Shiites because they know that a united front for both these groups would mean the regime’s ultimate decline. Gas is disbursed among protesters. As for the dilution of the Shiite majority within Bahrain, this is something that has been going on for a long time. For decades now, the monarchy has been working on minimizing the influence of the Shiite population inside Bahrain since they represent the majority and the biggest threat to the king— despite the fact that when we’re talking about human rights violations, they affect everyone equally. If you go back thirty or forty years, there has been systematic marginalization and discrimination against the Shiite majority in Bahrain. In the 1950s, there was an uprising called Intifadet El Hay’a, the uprising of the committee, and it was made up of Sunni and Shiite religious leaders. At the time, Bahrain was a British colony and so British forces came in and put down the uprising by arresting the heads of the movement; the Shiites were sent to exile in Iran and Iraq and the Sunnis were sent to Sainte-Helena Island. This was the turning point for the government, the moment they realized that they needed to do something about Sunni and Shiite unity, as that would pose a direct threat to the regime. At that point, the marginalization and discrimination against the Shiite population began. Today there are certain areas in Bahrain where Shiites are not allowed to buy or rent housing. There are certain jobs which Shiite people are not allowed to have and certain ministries of government that have zero percent Shiite in them. Aside from all this, there is also the issue of political naturalization; the constitution of Bahrain gives the king the right to politically naturalize anyone he wants. As it is in any other country, there are certain criteria that a person must meet in order to become eligible for the Bahraini citizenship and unfortunately, the many migrant workers that are actually eligible to receive the citizenship don’t get it because they don’t serve a purpose to the regime. Instead you have tens of thousands of Yemenis, Jordanians, Pakistanis and Syrians that are given the citizenship upon arrival. They receive government housing while many Bahraini families, whether Sunni or Shiite, have to wait up to thirty years in order to benefit from this service. The purpose of this is to use them in military forces and riot police, a sector that Shias are not allowed to serve in themselves and only certain Sunni families that pledge allegiance to the family are allowed to serve in. During a protest in Bahrain, you notice that the majority of riot police are Pakistani and don’t speak Arabic. The second reason for the use of this sectarian narrative in Bahrain is that the regime wants to change the demographics of the country. They want to substitute or replace the current population with a population that is loyal to the royal family. So they are attempting to shift from a Shiite majority to a Sunni one to ensure that they stay in power. At some point, the regime will create a poll to see how popular the royal family is among the people and by then the majority of the population will be political naturalized residents who have been given housing, work and a citizenship– the same people that will never go against the government that helped them in the first place. The regime chooses very specific people to bring into Bahrain. They are usually brought from extreme poverty to a country that is willing to give them housing and well-paying jobs in Bahrain to ensure that they never revolt. Why has the Bahraini protests not received the same media coverage as the Egyptian, Tunisian and Syrian uprisings? 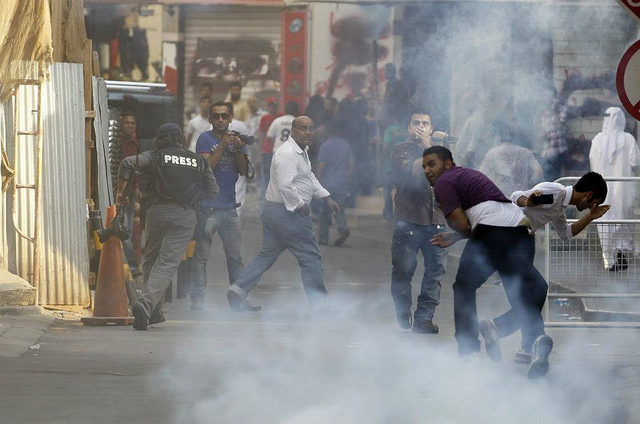 When you talk about international media, I’m not really sure why they don’t cover Bahrain. It’s possible that it’s because a lot of the media is privately owned and so it’s not a priority for these privately owned corporations to cover Bahrain. A journalist asked me the same question and so I reciprocated it. His response was that because the country was on lockdown by the government, media was not allowed in, they couldn’t get the stories of the people out. We even had a reaction from the international community when [former U.S. Secretary of State] Hillary Clinton stated Bahrain had the sovereign right to invite foreign troops into the country to bring down the protests. But there is no law in international conventions that gives Bahrain the right to do this. You had a foreign military from foreign countries coming in to bring down a popular uprising and yet no one spoke about it in the media. Your father has been sentenced to life in prison; is he treated well in the prison or are there cases of torture taking place? How does this affect your mission to spread awareness on the uprisings in Bahrain? My father and my uncle are in the same case. My father, Abdulhadi AlKhawaja, was sentenced to life in prison and my uncle, Salah AlKhawaja, to five years. While my sister, Zainab AlKhawaja, who is also detained in prison, has a total of thirteen cases against her in court because of protesting. She’s supposed to come out in February 2014 but that is if they don’t prolong it. The treatment in prison is very bad, both my uncle and my father have been victims of torture when they were first arrested and while detained– physically, psychologically and sexually abused. My father’s jaw was broken in five different places. Even in his hospital bed after major surgery on his jaw, they tortured him in the hospital bed and blindfolded him. However, the situation in the prison differs from time to time. They go through periods during which they will not be allowed to have visitors from family, friends, doctors or lawyers and suddenly they will be allowed to receive visitors but will be tormented in some other way. My father was on a 110-day hunger strike until he was force-fed. So there is no systematic way of treating them, it always changes. 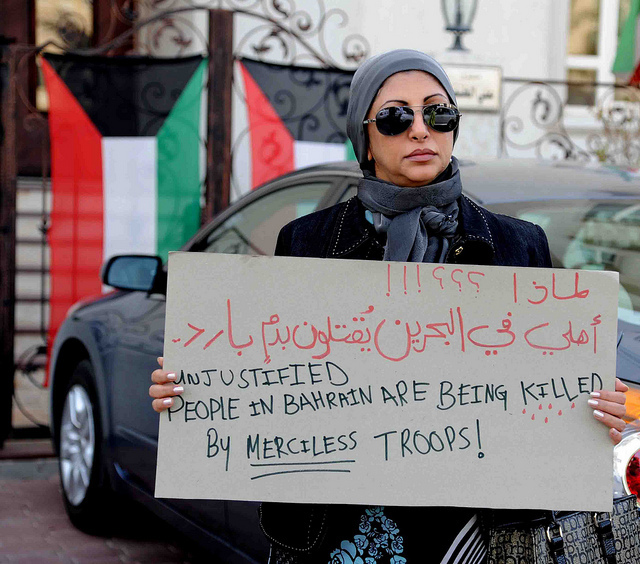 A Shia woman protests outside the Bahraini embassy in Kuwait. Photo courtesy of Ra’ed Qutena/Flickr. As for my sister, she wasn’t tortured in the prison but she was beaten by the riot police, dragged away and arrested during the protests. Right now, our major concern with her is that she is being held in a cell with other prisoners that have Hepatitis A and B, both can be contracted through sharing food and bathrooms, and the prison administration refuses to give her a vaccination. As a human rights defender, I learn to separate between my personal life and my work. When I’m writing a report or a statement, I’m lobbying about Abdulhadi AlKhawaja and Zeinab AlKhawaja, not my father and my sister. I’m talking about two political prisoners in Bahrain like the hundreds of other political prisoners. To me the priority goes to how serious the case is. When I was being interviewed during my father’s hunger strike, Salah Abbasi had just been killed and I kept making reference to Abbasi while the interviewer kept telling me that my father might die in the next few days. I responded by telling her that as a human rights defender, the person that’s been killed takes priority right now. We have to completely separate personal involvement with these cases and our work. You learn to normalize the cases and that’s what keeps you going. How do you respond to your opposition saying that you are a traitor to your country and that you are working for the Iranian government against your own people? They actually say that I work as a spy for the Americans, the Israelis and the Iranians at the same time. Usually, I say that I must be the smartest person in the world for bringing those three together and that a lot of governments owe me a lot of money that I would like to get soon. The thing is, anyone that follows my work knows how ridiculous this is. I also work for the Gulf Center for Human Rights and so within the center we cover human rights violations in Iran and stand in solidarity with human rights defenders in Iran as well. It hasn’t had any impact on my life. How has your public and open call to oust the monarchy affected your every day life? How has exile from Bahrain affected you and your family? I’m not really calling for the ouster of the monarchy. I’m calling for the trial of the king, the crown prince and the prime minister and for them to be sent to prison if they are found guilty of the crimes that they committed. So technically, I am calling for the ouster of the regime but from a human rights perspective because as a human rights defender, I can’t say that I demand the fall of the regime, I can only call for them to be put on trial. In terms of the influence it has on my life, the worst part of this line of work is the paranoia that comes with it, the feeling you have that every person you meet or even people you already know may be part of the intelligence unit. Due to that, you have a great deal of difficulty trusting people, especially since I work for the Gulf Center for Human Rights that covers cases in Saudi Arabia, Qatar and the Emirates. I always feel like I’m being watched everywhere I go. When you become a human rights defender, you trade in your privacy for the position, everything you do can be made public at any point in time. At first, I imposed exile on myself. My father had convinced me that making sure the international community knows what’s happening in Bahrain is as important as participating in the uprisings and sometimes even more important. He told me that there were hundreds of thousands of people taking part in the uprisings in Bahrain and only a handful of people on the outside talking about it. So I made the decision to leave and as soon as I left, the GCC forces came in. I knew that if I chose to go back, I would most likely be facing the same things that my father and uncle are facing now and so the exile was no longer self-imposed. I have, however, gone back in January to visit my father in prison and because I had work to do on the ground in Bahrain. I had a plan to go back again in August but I was denied boarding by British Airways on the request of the Bahraini government. The airline company can deny boarding to any passenger because you sign an agreement giving them this right when you purchase your ticket. However, the Bahraini government does not have the right to deny a Bahraini citizen from entering the country or even staying there if they wanted to. I’m already looking into different ways that I can bring up the issue and try to see what the justification for such a move is. And how I can hold them accountable for it as they did not provide any type of explanation for the denial of my entry into the country. The government has called for some reforms in the way the police treated the protesters and prisoners, do you think that this is a step in the right direction on the part of the government or simply a diplomatic move in hopes that it may calm everyone down momentarily? Any type of reforms that the government has put in place since the uprisings began is not for the protesters the smokescreen of reforms in Bahrain is all a public relations campaign to let the international community know that they are making reforms. Protesters on the ground can see that the police are not changing their tactics in the way they deal with them. There is still excessive use of force and the abuse and torture continue on a daily basis. So they know that the reforms that the government mentioned are not being applied. The regime merely wants the chance to tell their allies that they are changing and so there is no need for them to make any statements about the situation in Bahrain anymore. Everything is okay on the ground and we are hearing what our people want and responding to their demands. But in reality, the human rights situation has further deteriorated. Bahrain is known for its public relations campaigns. The regime spent millions of dollars in the last two and a half years to fund public relations firms to make themselves look better in the international community. What can the international world do in order to help the people on the ground in Bahrain? Is there any hope that through negotiations on an international level, the government would feel inclined to meet the demands of their people? There’s a lot that can be done with Bahrain. At no point in time, did anyone in Bahrain ask for military intervention, we don’t want that at all… For Bahrain to change towards the better, the countries that claim to hold human rights and democracy as the cornerstone of their foreign policy must actually live up to their claims instead of having double standards and choosing which countries they want to help and which they don’t. By applying pressure, threatening economic and human rights sanctions that will make them known as human rights violators–this can go a very long way with the situation in Bahrain. The country depends a great deal on their international reputation because Bahrain’s main source of the economy is business and finance, so they need to uphold a good reputation in the international community to continue the flow of investors and businesses that are coming into Bahrain. Unfortunately, foreign policy is always about national interest.